Because memory foam is a complex material, and different ones react to heat and humidity differently due to their different formulations. They also have differences in their cell structure (the various degree of “openness” of their cell structure) which can also affect a foam feel and pressure relief characteristics. That is why two memory foams with the same specs in terms of density (which is just the weight of the foam, specifically the weight of a cubic foot of the foam (a cube of foam that is a foot in each dimension) and its ILD/IFD (how much pressure is exerted to indent the foam a certain amount — the higher the number, the more pressure that was needed, so the stiffer the foam. Our memory foam, as an example, is soft and so it has an ILD/IFD of 13. Foam used for car seats may have ILD/IFDs of over 50). These difference in formulation mean that memory foam isn’t a commodity, and those memory foams with similar specs don’t necessarily feel the same. Which explains why in our test of 6 different mattresses with very similar specs of memory foam (and core foam as well), we had wildly different ratings from the testers in terms of these mattresses’ overall comfort. The highest rated mattress, the one we now sell, had about 20% higher satisfaction ratings and less than 1/2 the returns of other ones we tested. So while I do think density does has some basic value in that I’ve found that low density memory foam (below 4-lb memory foam) doesn’t have the feel or comfort of 4-lb or higher memory foam, all 4-lb memory foams are not the same for comfort and the only way to really assess this is by having real people try it and assess it as we have in our tests. Our focus on making sure that the memory foam we use in our memory foam mattress and topper pads is the most comfortable anywhere is why, I believe, our customer ratings are so much higher than those generally found for memory foam mattresses. While according to SleepLikeTheDead.com memory foam mattresses generally get a satisfaction rating of 81% (with the “leading brand” of memory foam getting an 80% satisfaction rating), with 400+ reviews, 96% of our 10″ Memory Foam Mattress reviewers say they would recommend it to a friend, and 95% give it 4 or 5 star ratings. Similarly, with 100+ reviews, 98% of our memory foam topper reviewers say they would recommend our toppers to a friend. Not all memory foams get these high ratings — so don’t just look at density or ILD/IFD when you buy a memory foam mattress or topper, make sure you check reviews to see how they really stack up for comfort. 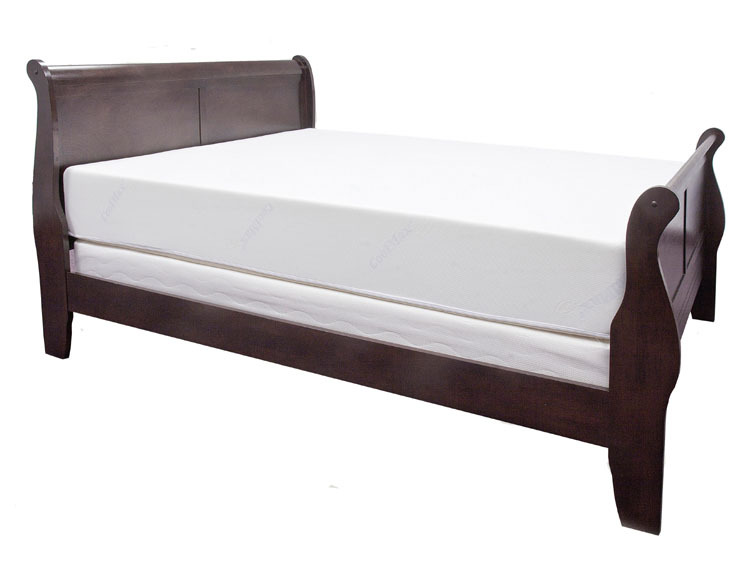 For more information on our mattress, see our Memory Foam Mattress Page. Previous Previous post: Buying a Memory Foam Mattress: Beware the Comfort Guarantee!